Lookout, a company that offers security services for a number of smartphones, is launching a new feature today that will protect users from online threats while browsing on a mobile phone. For background, Lookout’s web-based, cloud-connected applications for Android, Windows Mobile and BlackBerry phones help users from losing their phones and identifies and block threats on a consumer’s phone. Users simply download the software to a device, and it will act as a tracking application and a virus protector much like security software downloaded to a computer. (but enhanced for mobile devices). The fact is that smartphone users are now at risk for phishing scams, drive-by downloads and malicious sites on mobile browsers. And because users are clicking website links from a variety of apps on a mobile device (i.e. via Yelp, Twitter, email client, Google search and more), users need to be protected against suspicious sites. Lookout’s Safe Browsing reviews every website in real time before the site loads to confirm it is safe. 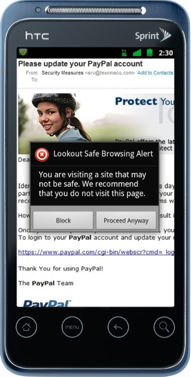 If a user unknowingly clicks on a link to a bad site, Safe Browsing will block access to the site automatically. Safe Browsing, which is part of Lookout Premium. We have a special deal for TechCrunch readers who want to download the app; the startup has given readers $5.00 off the app if they use the code SURFSAFETC (the offer expires in a week). Lookout is also announcing a deal with carrier Sprint to feature the app on their phones in the Android Market and more. This adds to previous deals with Verizon and T-Mobile. There’s no doubt that Lookout is on a roll. In December, the company had 4 million users and has now more than doubled that number, with nine million users. And the company just raised $19.5 million in funding from Index Ventures, Accel Partners and Khosla Ventures. I think it’s safe to assume that 2011 will be a big year for the company.